University of Canterbury students in the 2018 UC Motorsport team have designed and built two state-of-the-art race cars to enter in the highly competitive international Formula Student event this summer – one electric race car (pictured left) and the other race car driven by a more conventional combustion engine. 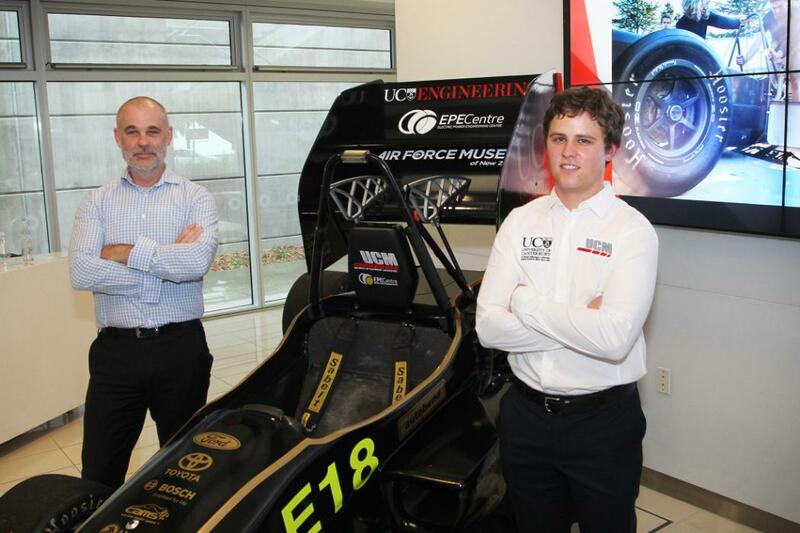 Faculty advisor to the UCM team, UC Design Engineer Bruce Robertson (left), and UCM team project leader and Commerce student Jacob Ewing are pictured with the electric race car. The team of UC students entering two Formula-style race cars in the hotly contested competition, 6 - 10 December at Winton Motor Raceway, Victoria, Australia, will be vying for supremacy with hundreds of students from around the world. The UC students’ electric race car is the only four-wheel-drive electric race car designed and built in New Zealand. The UCM combustion race car has been sponsored by Triumph Motorcycles, which provided the team with three-cylinder engines. UCM team project leader and Commerce student Jacob Ewing says the team can’t wait to get the innovative Kiwi race cars on the track in Melbourne next month to show the world what they can do. “This project has been an unreal experience, juggling managing an international motorsport team with coursework and exams as well,” Jacob says. Formula Student is an international engineering-design competition where more than 600 university racing teams from around the world design, construct and race single-seat race cars. Faculty advisor to the UCM team, UC Design Engineer Bruce Robertson says that this has been a great year for the Canterbury students, in the fifth year UC has competed in the Formula Student contest. “Building an EV and a combustion car has been a massive learning opportunity for the team,” he says. Formula Student is an international student competition centred on the design, construction and racing of an internal combustion or electric race car up to 710cc/80kW. The competition presents students with the opportunity to develop their skills in design, management, manufacturing, communication and business operations in a real world environment. Formula Student graduates are highly sought after by employers.